Mayoral candidate Suzanne Anton and other members of the NPA team. Screen capture from NPA website. 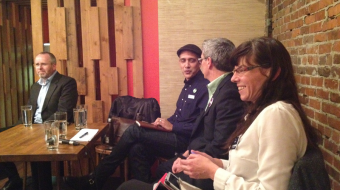 2011 Vancouver Municipal Election: The municipal election is just weeks away, and campaigns for the major Vancouver parties are starting to kick into gear. Earlier this week, we outlined the history and objectives of incumbent leaders, Vision Vancouver. Now, here’s some helpful information on their biggest competitors, the Non-Partisan Association (NPA). 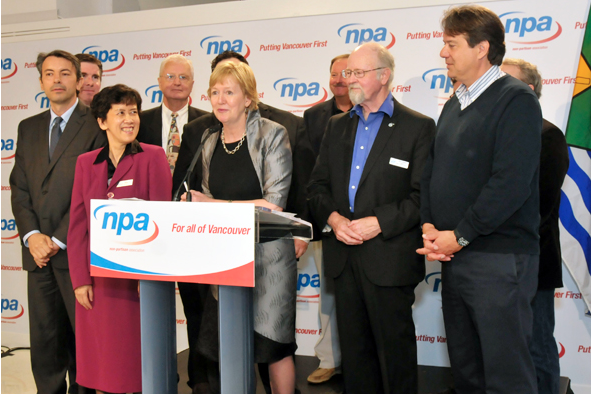 As a centre-right option for voters, the NPA has historically drawn much of its support from the city’s business community, as well as from neighbourhoods in South Vancouver and on the west side. 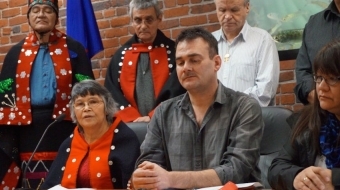 There have been 11 mayors elected representing the party since it was established, including former BC Premier Gordon Campbell from 1986 to 1993 and Sam Sullivan, who preceded Gregor Robertson as mayor from 2005 to 2008. Peter Ladner was chosen to succeed Sullivan and run in the 2008 election, but lost by over 18,000 votes. This year’s NPA contender is first-time mayoral candidate Suzanne Anton. She has served for two terms as a City Councillor – currently the only NPA councillor at City Hall – and before that served for three years on the Vancouver Park Board. As a councillor she’s been focused on issues like land use, transportation and the environment. Her civic involvement began with an interest in community sport projects, such as the MoreSports initiative she founded to help and encourage youth to get involved in extracurricular activities. Before entering politics, Anton spent several years as a math teacher overseas in both Portugal and Nigeria. She also previously worked as a Crown Counsel lawyer. One of the interests Anton shares with her rival, Gregor Robertson, is a passion for cycling. She and her partner, Olin, completed a cross-Canada bike trek in 2009 and followed it up the next year with a cycling trip through Europe. NPA campaign manager Norman Stowe has been a driving force behind this year’s election efforts, starting with an early and provocative radio and web campaign featuring attacks on Vision’s urban agriculture initiatives. Stowe came to the NPA from the Pace Group, where he is a managing partner in communications and marketing. With over a quarter-century’s worth of experience in both private and public sectors, he’s a valuable asset to the team. 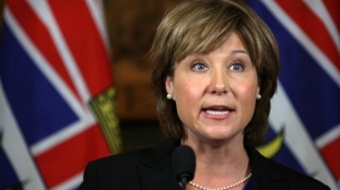 And his current client list is nothing to scoff at – it includes big names on the West Coast like the Vancouver International Airport, BC Ferries and the Province of British Columbia. As for the slate, the NPA has an extensive lineup running for council, parks and school board, hoping for a few more friendly faces at City Hall this time around. Former councillor Elizabeth Ball and Sean Bickerton, co-founder of the Vancouver Not Vegas! coalition, are both in the running for council alongside eight other NPA candidates.